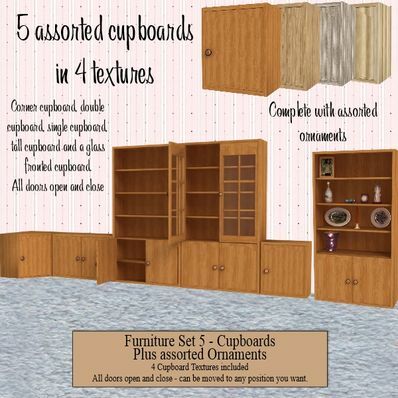 A 5 piece cupboard set complete with assorted ornaments for use in Daz 4.6. 4 cupboard textures included. All doors open and close. Assorted ornaments with extra textures. Thank you Wendy, for sharing all this wonderful stuff. Awesome! Great looking cabinetry and the ornaments are awesome. Loving your furniture series. Well Done! Wonderful. Thanks a lot for everything I grabbed today. Oh... Happy Holidays again. Thank you so much!! Just awesome!! I can't believe the detail you put into this set! You are amazing!!! Thank you. Thank you ! It is beautiful! Thanks for your great work. These will come in very handy. Thanks so much.. Thank you so much for all your beautiful, realistic and practical models. Very handy furniture to have. Thanks! Thank you so very much! All your hard work and TLC is deeply appreciated.